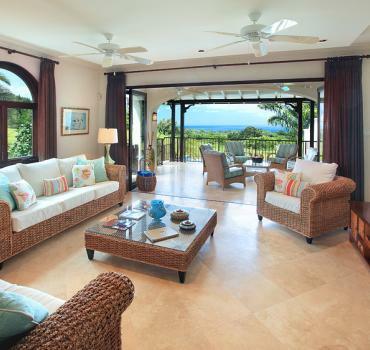 Cocomaya, a beautiful 5 bedroom villa located in the stunning Apes Hill Club Barbados Golf and Polo Development, Overlooks the 17th Hole with spectacular sea and fairway views. Designed with luxury living in mind, the interior is beautifully decorated and features a fully-equipped Miele kitchen, spacious living area, dining room and 5 large bedrooms each with en-suite bathrooms. The outdoor space benefits from a large covered terrace, sun deck, gazebo and infinity-edge swimming pool with sea views. Amenities at Apes Hill Club include beach club, driving range, lap pool, resort pool, polo club, restaurant & bar, flood lit tennis courts and 24-hour security. The Country Club is indeed the talking point of the development as it is where like minded people meet daily to share either a sport or just time together.